As part of the Stone Collaboration Series, the R & R Coconut IPA was created by homebrewers Robert Masterson and Ryan Reschan, and brewed by the two homebrewers along with brewers of Rip Current Brewing Company and Stone Brewing Brewing Company. Masterson and Reschan won the Stone’s 2013 American Homebrewers Association homebrewing contest with this recipe. Now this innovative beer has seen the reality of being mass produced by one of America’s most known craft breweries, Stone Brewing Company. When I had first heard of this release, I was very excited, as this beer sounded like it would be a masterpiece of great flavors. This beer was consumed months ago, but it has now finally made the BMD website. This beer was produced once, August 2013, and I drank this bottle back in October 2013. Right now, if this bottle is still found anywhere, it it passed it’s drink by date, so be careful. Not sure if they plan on releasing this beer again later this year or not. 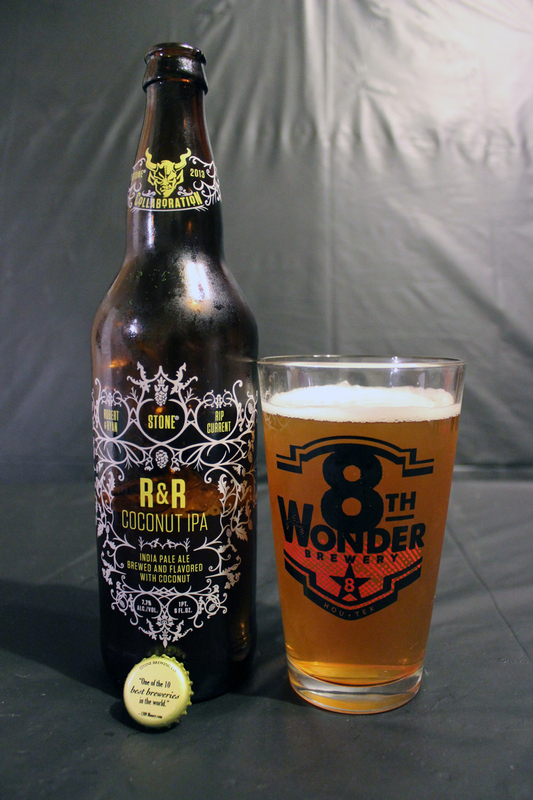 I used an 8th Wonder Brewing Company logo pint glass for this session. The beer poured a slightly hazy golden amber color crowned with a n inch thick white bubbly head, which reduced to a thin layer, but kept in tact throughout the drink. There was nice sticky spotty lacing down the glass. Nice looking beer! The aroma was a bit disappointing. I was expecting a large amount of coconut to be present in the nose, but I was met with mostly aromas of hops. It was a bit tropical, but mainly cause of the fruity hop presence, like citrus, grapefruit, also mixed with some pine, grass, earthy notes. There is a peppery smell, and a toasted malt aroma. The one thing I did not pick up on was the coconut. I was expecting a sun block, or a pina colada type of smell, even if faint, but I got none at all. The taste was just as disappointing as the aroma. Tropical, yes, but mostly with the hops, again. Citrus, grapefruit, a bit of papaya is dominant. There is a little pine, and grassy characters as well. Soon after the initial hops, it was followed by a nice peppery taste, then finished with a good bready, and toasted malt taste. Guess what, though? No coconut was present in the flavor at all. The body was just right for an American IPA, medium thickness with a nice smooth mouthfeel. There was a good bitter bite at the end. The beer left a silky lingering mouthfeel for a few moments after taking a drink. Overall, this was a decent American IPA, but it was named and advertised as a coconut IPA, and unfortunately the main ingredient was not present at all within this beer. I was thinking it was just me not picking up on the presence of the coconut, but I have read a lot of reviews on Ratebeer, Beeradvocate, and on Untappd, which all say the same thing. This 3 of 5 rating is probably the lowest I will ever give a Stone beer, as most of the time, they are spot on and rate a solid 4 or 5. As I said earlier, I am not sure if Stone plans on releasing any of their collaboration beers again, but I hope if they do, that they tweak the recipe a bit and actually make sure the coconut is present. Metal Connection: Sometimes when working on these reviews, I do run across a beer that I have no idea where to go when it comes to the Metal Connection. Sometimes I have to search for something new. 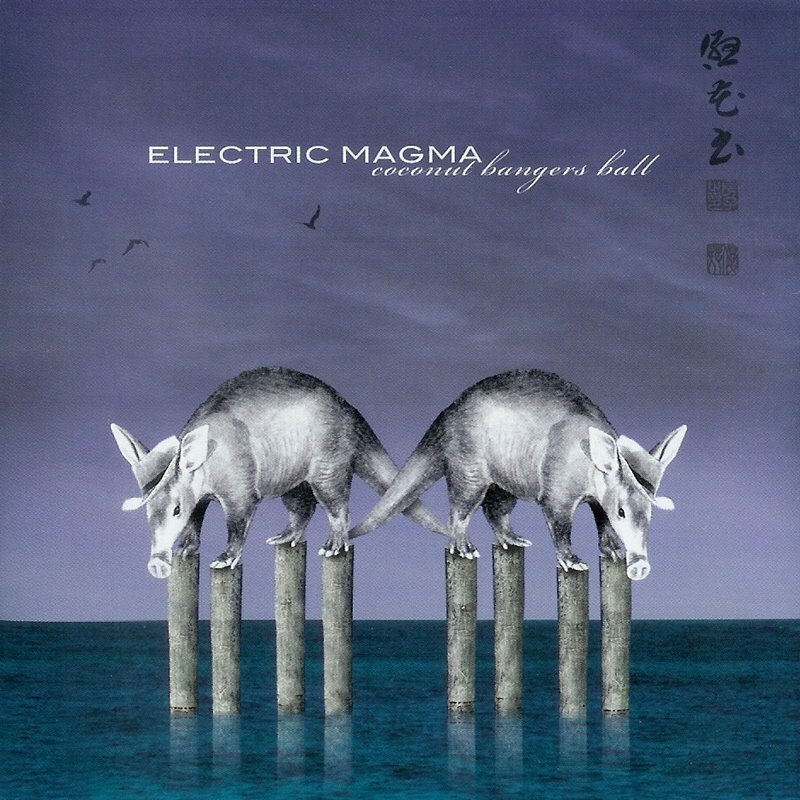 I typed in “coconut metal song” in Google (yes, this is true), and a link came up to an album called Coconut Bangers Ball by the band Electric Magma. I have never heard of this band before today, but I have to say, I was pleased with what I heard. Electric Magma is an instrumental Stoner Rock band from Canada. The song chosen is called Atomic Soothsayers & Bovine Maidens from the band’s fourth full length album. They have released two more albums since this release, and are still an active band. So the fact that I found a Metal album name with the word coconut in it definitely makes up for the lack of coconut within this beer.